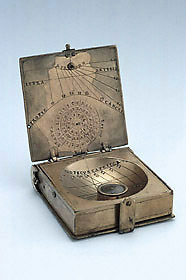 The compendium is in book form, with its covers carrying a simple circular engraved decoration. The reverse of the front cover carries a vertical pin-gnomon sundial for Italian hours, 14 to 24 and with lines for 'TROPIC CANCRI', the equator marked 'LIBRA' and 'ARIES', and the tropic of 'CAPR[IC]ORN'. Below the dial is a circular 'TABVLA S[OLI]S MOTVS', stamped XIII at its centre, and giving the signs of the zodiac occupied by the sun for each month of the year, as well as the sun's position in the sign at the beginning of the month. The central box of the compendium has a scaphe for Italian hours 10 to 24, marked with 'HORIZON', 'TROPICVS CAPRICOR' and 'TROPICVS CANCRI'. There is an inset compass with blued needle surrounded by a compass rose pointing out 16 winds and identifying the eight principal directions with the initial letters of their Italian names. The under and outer sides of the central box are blank. The inside of the back cover carries a circular table for 'MEDIA NOX PER TOTVMV [sic] ANNVM'. For two points in every month the table gives the time in Italian hours and minutes of midnight. From the information in this table it is possible to infer that the instrument was constructed for a latitude of approximately 41?.